With over 4,210 acres of both natural chaparral-covered terrain and landscaped parkland and picnic areas, Griffith Park is the largest municipal park with urban wilderness area in the United States. Situated in the eastern Santa Monica Mountain range, the Park’s elevations range from 384 to 1,625 feet above sea level. With an arid climate, the Park’s plant communities vary from coastal sage scrub, oak and walnut woodlands to riparian vegetation with trees in the Park’s deep canyons. The California native plants represented in Griffith Park include the California species of oak, walnut, lilac, mountain mahogany, sages, toyon, and sumac. Present, in small quantities, are the threatened species of manzanita and berberis. Over the years recreational attractions have been developed throughout the Park, however an amazingly large portion of the Park remains virtually unchanged from the days Native American villages occupied the area's lower slopes. 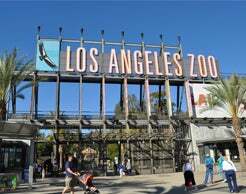 Today's Griffith Park offers numerous family attractions, an assortment of educational and cultural institutions, miles of hiking and horseback riding trails, and an ideal environment for enjoyable recreation activities. Originally a part of the Spanish land grant, Rancho Los Feliz, the park was named for its former owner, Colonel Griffith J. Griffith. Born in Glamorganshire, South Wales, Griffith emigrated to the United States in 1865, eventually making a personal fortune in Mexican silver mines and, subsequently, southern California real estate. In 1882, Griffith settled in Los Angeles and purchased a 4,071 acre portion of the Rancho Los Feliz, which stretched northward from the northern boundaries of the Pueblo de Los Angeles. On December 16, 1896, the civic-minded Griffith bequeathed 3,015 acres of his Rancho Los Feliz estate as a Christmas gift to the people of Los Angeles to be used as parkland. The enormous gift, equal to five square miles, was to be given to the city unconditionally - or almost so. "It must be made a place of recreation and rest for the masses, a resort for the rank and file, for the plain people," Griffith said on that occasion. "I consider it my obligation to make Los Angeles a happier, cleaner, and finer city. I wish to pay my debt of duty in this way to the community in which I have prospered." 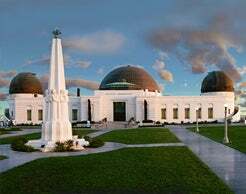 Griffith Park stands today as a monument to the dedicated vision of one man--Griffith Jenkins Griffith, Park Commissioner, civic philanthropist, and fervent advocate of parklands, and recreation for the health of Los Angeles. The Autry is a museum dedicated to exploring and sharing the stories, experiences, and perceptions of the diverse peoples of the American West, connecting the past to the present to inspire our shared future. The museum presents a wide range of exhibitions and public programs, including lectures, film, theater, festivals, family events, and music, and performs scholarship, research, and educational outreach. 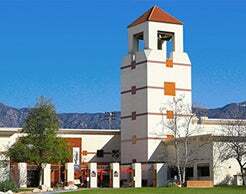 The Autry's collection of more than 500,000 pieces of art and artifacts includes the Southwest Museum of the American Indian Collection, one of the largest and most significant in the United States. Rent bicycles and tour Griffith Park, the largest municipal park in Los Angeles. Located in Park Center between the Los Angeles Zoo and the Los Feliz park entrance, the Griffith Park Merry-Go-Round has been a Los Angleles family attraction for over five generations. 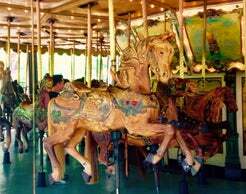 Built in 1926 by the Spillman Engineering Company and brought to Griffith Park in 1937, the Merry-Go-Round boasts 68 horses, everyone a jumper. Each horse is finely carved with jewel-encrusted bridles, detailed draped blankets and decorated with sunflowers and lion's heads. A Stinson 165 Military Band Organ, reputed to be the largest band organ accompanying a carousel on the West Coast, plays over 1500 selections of marches and waltz music. 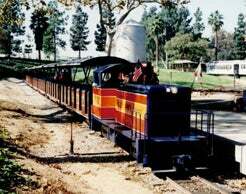 The miniature train ride has served the public in Griffith Park since 1948. Youngsters of all ages enjoy the experience of riding the FREEDOM TRAIN or the COLONEL GRIFFITH on the Griffith Park Southern Railroad. The track stretches over a mile and takes the rider past pony rides, through a lush green meadow, through an old Western town, and past a Native American village. 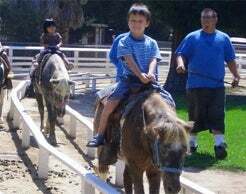 Ask any horse lover: the Los Angeles Equestrian Center is the premier equine facility of its kind. 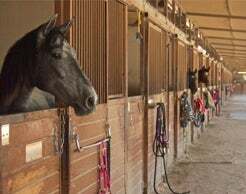 A pleasing and professionally operated multi-use facility in Southern California with everything the discerning horse owner and event organizer could ask for and more. 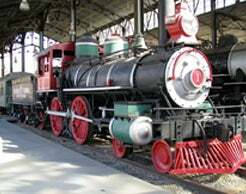 Located adjacent to the Travel Town Museum is a local club devoted to the preservation of locomotives through scale models. 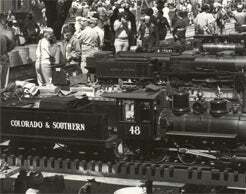 Free public rides are offered by the club on their live steam scale model trains. Located at the Los Feliz entrance to the Park. Ponies and horses give youngsters safe rides around an oval track. Miniature covered wagon rides are also a feature of the pony concession. Travel Town Museum is a transport museum dedicated on December 14, 1952, and located in the northwest corner of Los Angeles, California's Griffith Park. Hiking into the rugged hills and sparsely developed areas is perhaps one of the most popular forms of recreation in Griffith Park. Hikers are allowed to use the entire 53-mile network of trails, fire roads, and bridle paths. Maps of trails and current information on trail closures and special restrictions are available at the Ranger Station, (323) 913-4688. All trails in the park are closed at dusk. Open fires and smoking are not allowed. One of the most rewarding hikes in the park is the trail leading from the Observatory parking lot to the summit of Mount Hollywood, the highest peak of the park, which affords spectacular views of the entire Los Angeles Basin. Hikers should approach the park with caution; Griffith Park is a wilderness area with wild quail, rodents, foxes, coyotes, rattlesnakes, and deer.